This graphic from the University of Alabama Hillel shows how serious Southern Jews are about their football. For No. 1 Alabama, it is a chance to avenge the only loss from its 2012 national championship season and quiet the talk about Johnny Football. For No. 7 Texas A&M, it is an opportunity to say that last season was no fluke, and that despite all the off-season drama, Heisman Trophy winner Johnny Manziel and the Aggies are forces to be reckoned with in the national championship hunt. For Jews who bleed crimson or consider themselves the 12th man, though, it is Yom Kippur afternoon. Yom Kippur, the Day of Atonement, is marked by a 25-hour fast where all who are physically able abstain from food and drink, from sundown on Sept. 13 to sundown Sept. 14. Services in the synagogue last the entire day, and as on the Sabbath, all types of work are prohibited. For traditional Jews, that includes operating anything that uses electricity — including radios and cell phones. 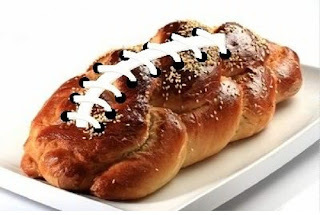 The clash of religions — Judaism and college football — will play out on the holiest holy day on the Jewish calendar next weekend. Kickoff for the nationally-televised game is at 2:30 p.m. on Sept. 14, which is during the break between services for most congregations, but by the time afternoon and concluding services start, there will be plenty of time left on the scoreboard in College Station. Rabbi Matt Rosenberg, executive director of the Hillel at Texas A&M, said news of the schedule conflict reached him before he was ordained last spring, well before his arrival on campus. The 2:30 p.m. kickoff, he said in a post for the Southern and Jewish blog, works out well. “We could easily complete the additional musaf service and perhaps mincha well before kickoff,” and the new Hillel is across the street from the stadium. “I determined that we’d be able to resume our closing services at 6 p.m., which should coincide with the end of the big game,” he said. Yom Kippur ends at 8:06 p.m. in College Station. It is a Texas A&M tradition that students stand during the entire game, as a 12th man for the team. Rosenberg said Jewish students are trying to get tickets in a section reserved for students that have to remain seated, and he hopes for mild weather during the fast day. The Texas A&M Hillel has extended an invitation for its Yom Kippur services, dinner and break-fast to all Alabama students with current identification without charge. For Alabama faculty, staff and supporters, tickets to the Hillel events can be obtained with a suggested minimum donation of $100. The first word on the controversy in Alabama came from Rabbi Randall Konigsburg, who just started as rabbi of Temple Beth-El in Birmingham. In a new-rabbi-in-town profile for the Birmingham News last week, he said toward the end of the piece that “if you really want Alabama to win, you have to come pray first.” That line was picked up as the headline for the piece. Beth-El’s service generally finishes between 2 and 2:30 p.m., then there is a “community conversation” speaker at 3:45 p.m. before the afternoon and concluding services. On Sept. 5, a congregant of Birmingham's Temple Emanu-El posted what was in their Rosh Hashanah handout that day, a football blackout warning that immediately went viral on the Internet. There's also the violation of the spirit of Yom Kippur, though Reform congregations are generally more lenient in the use of technology during the holiday. The Emanu-El clergy's attachment to football goes back many decades. In the 1950s to 1970s, when Alabama played home games at Legion Field in Birmingham, Rabbi Milton Grafman (of blessed memory) had choice seats in the stadium bond-holder section. He would make sure Shabbat services were done by noon so he could hop into his red convertible and be in the stands well before the typical 1:30 p.m. kickoff. The Emanu-El notice concluded by stating that “If even a peep gets out, our pages in the Book of Life will be compromised and all of us will suffer." The Southeastern Conference’s commissioner, Mike Slive, is a member of Emanu-El and was in attendance on Rosh Hashanah. Emanu-El’s afternoon service begins at 2:15 p.m., followed by a discussion at 3:15 p.m., a healing service at 4:15 p.m. and the memorial and concluding service at 4:30 p.m.
Southern Jewish Life columnist Doug Brook, a Birmingham native now living in California, has issued a stern warning to his friends in San Jose to not hint at the game’s outcome and let him watch it on Tivo after the end of the day. “If Jews believed in hell, it would hath no fury,” he said of any attempt to ruin it for him. While Texas A&M-Alabama is the big game on Sept. 14, there are other matchups involving area universities that hit entirely or partially during the holy day. Mississippi State and Auburn have small Jewish student enrollments, but each has developed a Hillel in the last few years. Their game next weekend kicks off at 6 p.m. in Auburn, meaning the end of Yom Kippur will be right around halftime, at 7:27 p.m. When the schedule was announced last spring, the news put a damper on what had become a tradition, a joint tailgate between the Mississippi State and Auburn Hillels. LSU also has a 6 p.m. home game, against Kent State, while Vanderbilt is at South Carolina for a 6 p.m. (Central) kickoff. For Tulane, where one-third of the student body is Jewish, there is no issue. Tulane’s game at Louisiana Tech is on Thursday night. The University of Alabama at Birmingham, which has a small Jewish enrollment, has an off week. In a few months as the 2014 schedules are unveiled, the drama will begin yet again, as Yom Kippur falls next year on Saturday, Oct. 4. So depending on the games, rabbis will be fighting the battle between Southern Jews’ two religions, trying to keep the emphasis on the Day of Atonement and being sealed by God in the Book of Life for the coming year. After all, despite all the off-season drama and pre-season hype over this year’s game, on Yom Kippur there is only one signature that really matters.